Build A Green Bakery or the "Birdbath Bakery" is a bakery in the east village that may be the most environmentally friendly bakery ever. Everything inside is made of recycled materials. Nothing inside contains Volatile Organic Compounds (VOCs) which are compounds that are bad to release into the atmosphere. 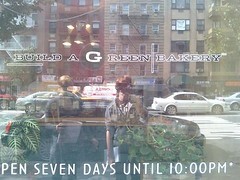 The front window of the Birdbath Bakery, clearly showing it as a green building.